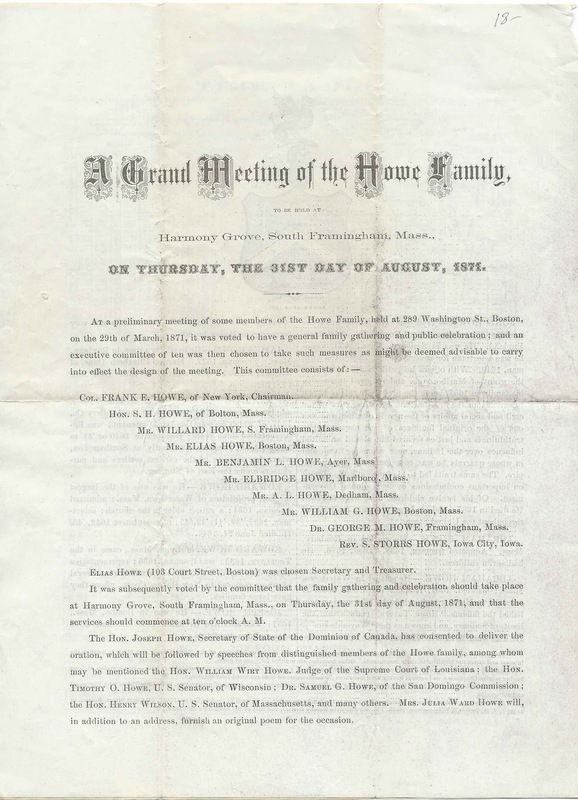 Large brochure announcing the Grand Meeting of the Howe Family to be held at Meadow Grove, South Framingham, Massachusetts, on August 31, 1871. 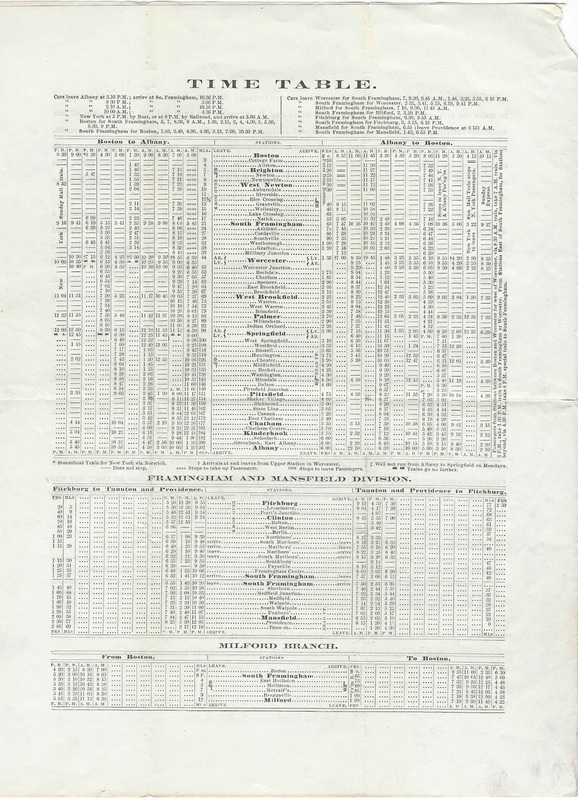 The brochure is comprised of a single sheet folded into four panes, measuring 8-1/2" by 11" each. "To this beautiful 'Harmony Grove', every person bearing the name of Howe or How, as well as every one connected by ties of marriage with this family, or descended from this family, is most cordially invited, for the purpose of spending the day above-mentioned 'in union sweet and dear esteem; of calling to mind the days of 'Auld Lang Syne' and of telling one another how we love the good old family name of Howe. 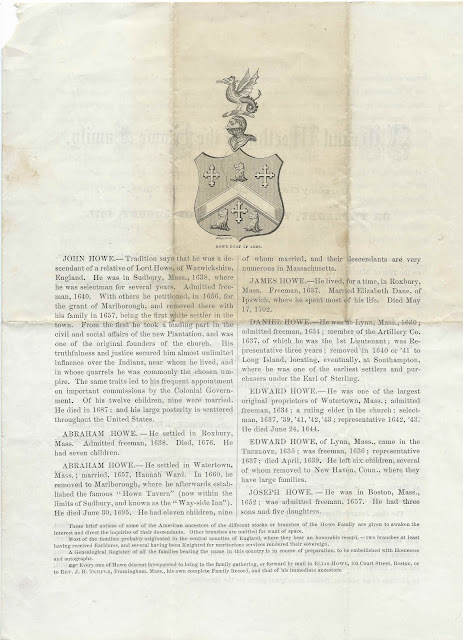 Should any one possess any ancient records, portraits, or relics pertaining to the family, let him not fail to bring them for the 'Howe Cabinet', to be exhibited on the occasion." Read an account of the meeting written after the fact by Elias Howe in 1871 here. Information about the upcoming meeting - time, place, music; lodging, etc. John Howe; was at Sudbury, Massachusetts in 1638; served as selectman; petitioned in 1656 for the grant of Marlborough, became first white settler in the town in 1657; umpire in disputes with Indians; twelve children, nine of whom married. John died in 1687. Abraham Howe; settled at Roxbury, Massachusetts; admitted freeman in 1638; seven children. Abraham died in 1676. Abraham Howe; settled at Watertown, Massachusetts; married Hannah Ward in 1657; moved to Marlborough in 1660 and established "Howe Tavern", what is now the "Way-side Inn at Sudbury, Massachusetts [at least it was in Sudbury in 1871, the date of the brochure]; eleven children, nine of whom married. This Abraham died June 30, 1695. James Howe; lived at Roxbury, Massachusetts; admitted freeman in 1637; married Elizabeth Dane of Ipswich and spent most of his life at Ipswich. James died May 17, 1702. Daniel Howe; was at Lynn, Massachusetts in 1630; admitted freeman 1634; ; 1st Lieutenant in the Artillery Company; representative for three years; settled on Long Island at Southampton "where he was one of the earliest settlers and purchasers under the Earl of Sterling". Edward Howe; one of the largest original proprietors of Watertown, Massachusetts; admitted freeman 1634; ; church elder, selectman in 1637, 1639, 1641-43; representative 1642-43. Edward died June 24, 1644. Edward Howe of Lynn, Massachusetts; came in the Truelove in 1635; freeman in 1636; representative in 1637; six children, several of whom removed to New Haven, Connecticut. This Edward died April 1639. Joseph Howe; was at Boston, Massachusetts in 1652; admitted freeman in 1657; three sons and five daughters. 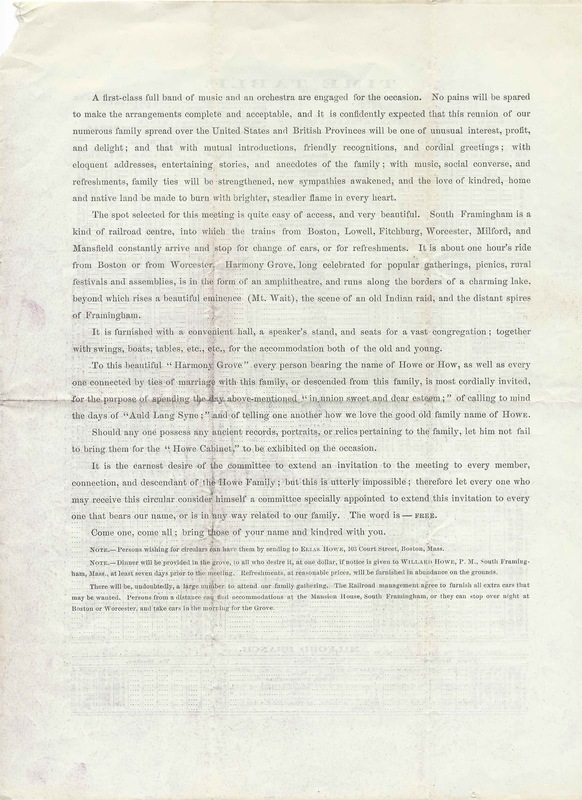 "These brief notices of some of the American ancestors of the different stocks or branches or the Howe Family are given to awaken the interest and direct the inquiries of their descendants. Other branches are omitted for want of space." "Most of the families probably originated in the central counties of England, where they bear an honorable record, - two branches at least having received Earldoms, and several having been Knighted for meritorious services rendered their sovereign." 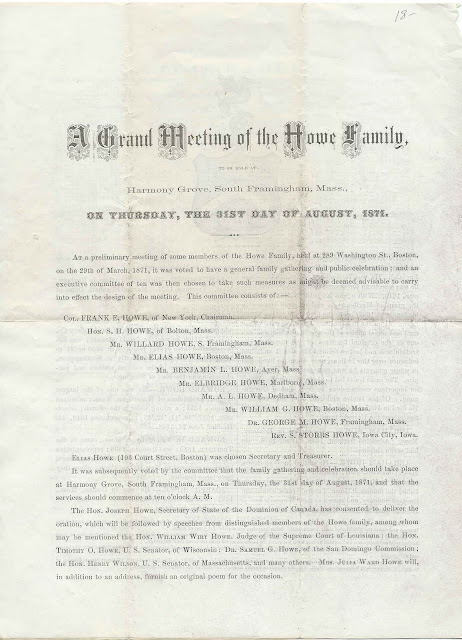 "A Genealogical Register of all the families bearing the name in this country is in course of preparation, to be embellished with likenesses and autographs." 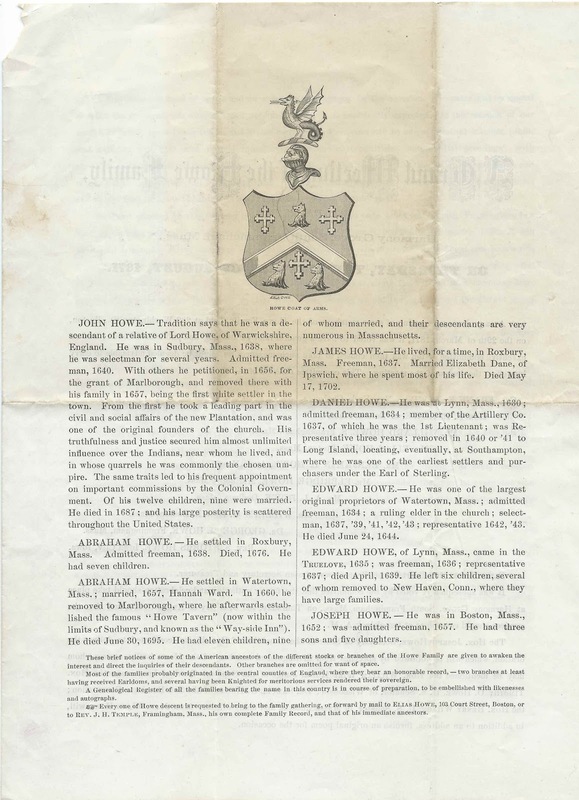 "Every one of Howe descent is requested to bring to the family gathering, or forward by mail to Elias Howe, 103 Court Street, Boston, or to Rev. J. H. Temple, Framingham, Mass., his own complete Family Record, and that of his immediate ancestors." Since the brochure mentions that Harmony Grove was near a train junction and a lake, it may have been located along the shore of Waushakum Pond or one of the other bodies of water within Framingham.